Description: An essential guide for scholars and students, this volume includes essays presented in the Ancient Fiction and Early Christian and Jewish Narrative section of the Society of Biblical Literature. Contributors explore facets of ongoing research into the interplay of history, fiction, and narrative in ancient Greco-Roman, Jewish, and Christian texts. Each essay examines the ways in which ancient authors in a variety of genre and cultural settings employ a range of narrative strategies to reflect on pressing contemporary issues, to shape community identity, or to provide moral and educational guidance for their readers. This volume highlights the growing importance of strategies to integrate the fruits of this research into the university classroom and beyond. 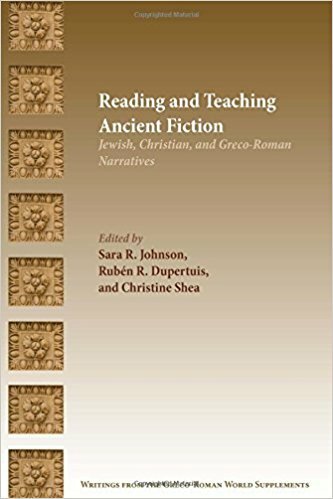 Citation: Andrew Tobolowsky, review of Sara R. Johnson, Rub�n R. Dupertuis, and Christine Shea, eds., Reading and Teaching Ancient Fiction: Jewish, Christian, and Greco-Roman Narratives, Review of Biblical Literature [http://www.bookreviews.org] (2019). SBL members may volunteer to review this title. Enter your SBL Membership ID and click the "Volunteer" button. If you would like to join SBL now, click here.